Marking off the numbers playing video Keno. Keno is the lottery-style game which found it’s way from Asia to the United States in the mid-19th century when Chinese railroad workers brought the concept with them. It’s not played particularly widely in Europe or the UK where Bingo tends to be more popular but in the US and Australia it’s one of the gambling games of choice. Now if you’ve arrived at this article hoping to find some sort of little-known strategy for winning at Keno then you’re going to be disappointed; Keno is a true game of luck with a scarily high house edge of around 20% – 40%. Let’s get to grips with the basic rules first and each round of Keno involves a game card displaying 80 numbers; the player decides how many numbers they would like to try and match – usually 1 to 10 after which 20 numbered balls are automatically drawn. If your numbers are matched during that draw, you win. Because each game features 80 balls and 20 drawn numbers the odds of striking lucky on any given pick remain the same. Picking and matching one number offers odds of 4/1 while at the other end of the scale picking and matching ten numbers gives odds of 8,911,712/1 – clearly a tough ask. For a comparison, the odds of picking 6 correct numbers in the UK lottery are 13,983,816/1. Now bear in mind that the top prize for a Keno draw might be something like $100,000 while the UK lottery offers several million pounds and the former starts to look like a poor deal. Still, it’s very popular despite the low odds of winning and the relatively paltry prizes and video Keno is a big reason. 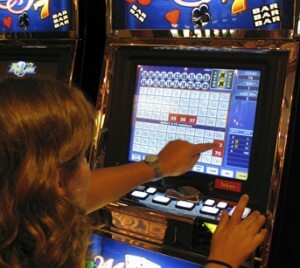 Players can zoom through games at a much greater rate than live Keno although this means losses will be greater over a given period. So, you ask, are there no strategies at all? Unfortunately not and any website which tell you otherwise is not being entirely truthful. However if you are playing in a city such as Las Vegas or Atlantic City then there is some competition between the casinos. This means that at any given time, one casino might be offering slightly better odds for certain picks. It’s not much but it’s something!